My knowledge of YA authors is rather slim. I've read most of Rainbow Rowell's books and of course know about the juggernaut that is John Green. Other than that, I tend to steer clear of the young adult section. When I do happen to wander over that way, it's rather daunting to know where to start. I thought this anthology of holiday stories might help me whittle down my list and pick a few YA authors to try. It did. It was also a total delight to read and I can see myself buying this anthology and cracking it open each December. These stories are all centered around the holidays, but I appreciated that they weren't all about Christmas. The first story, by Rainbow Rowell, was about two best friends at their annual New Year's Eve bash over several years. Two other stories feature Jewish protagonists and Holly Black even tackles Krampuslauf, which celebrates the evil spirit who visits bad children instead of Saint Nicholas. Each of the writers featured in this collection wrote really good stories that left me wanting a longer story, perhaps even a whole book. Some of these characters are still in high school and others are in their first years of college, but there was a good balance of teenage impulse and the beginnings of understanding about relationships and responsibility. Shy is spending Christmas cat-sitting for his boss in "Angels in the Snow" and Maria from "Welcome to California, CA" is working in the local diner because of family financial problems. There is also a variety of settings, time periods, and genres to be found between these covers. "The Lady and The Fox" and "The Girl Who Woke The Dreamer" are both set in the past and have supernatural flair. "It's a Yuletide Miracle, Charlie Brown" and "Your Temporary Santa," on the other hand, are decidedly modern and feel like they might have happened to your friend or maybe even to you. It's rare to find an anthology where you enjoy all of the stories. 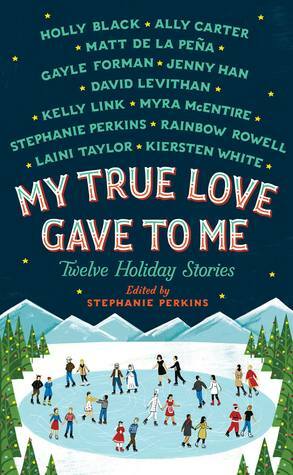 While I obviously had favorites, this is a fantastic collection of stories that celebrate the joy of relationships and the magic of the holidays. My True Love Gave To Me is the perfect choice to read while hiding out from your crazy family on Christmas, while lazing about on winter break, or just when you are craving a bit of holiday magic at any point during the year. This was a really good anthology! This sounds really good. It seems like a good way for someone like me, who doesn't read much YA, to get a feel for the authors who are writing these novels. I don't read anthologies, not really, and I don't read Christmas book. But there's something about this one that has caught my eye this past season. It's a little out of my wheelhouse as well, but I'm so glad I took the chance! I enjoyed it quite a bit. I'm not usually one for holiday themed reads, but this one worked for me! I'm glad you enjoyed My True Love Gave To Me - I did too. Like you, I thought it a great way to experience some YA authors and become familiar with writing styles. Which authors do you plan to read as a result?